The one that most people didn’t expect as a Rolex novelty at Baselworld 2014… We already knew that the Black Dial version without the green crystal (Ref. 116400) was going to be phased out. 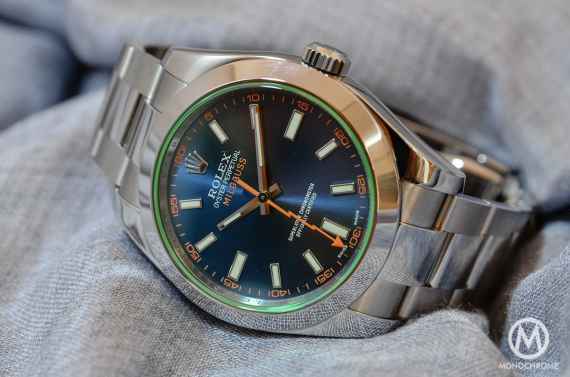 What the watch world didn’t expect was the arrival of a new version of the Milgauss, especially one with a blue dial. No one except us! 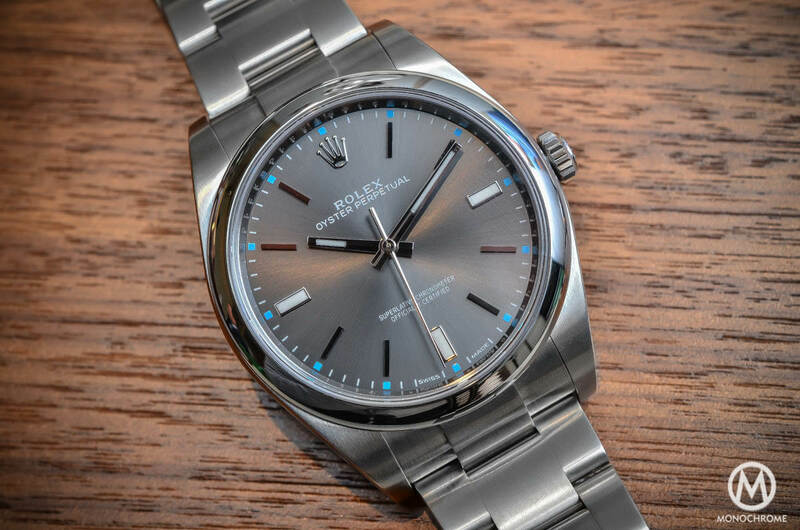 In our yearly Rolex’ rumors article, we presented to you a blue dial on the antimagnetic Rolex – but, we must admit, with a less beautiful color. And once on the wrist, we must say that the ‘Z Blue’ (its nickname) is a pretty interesting novelty. 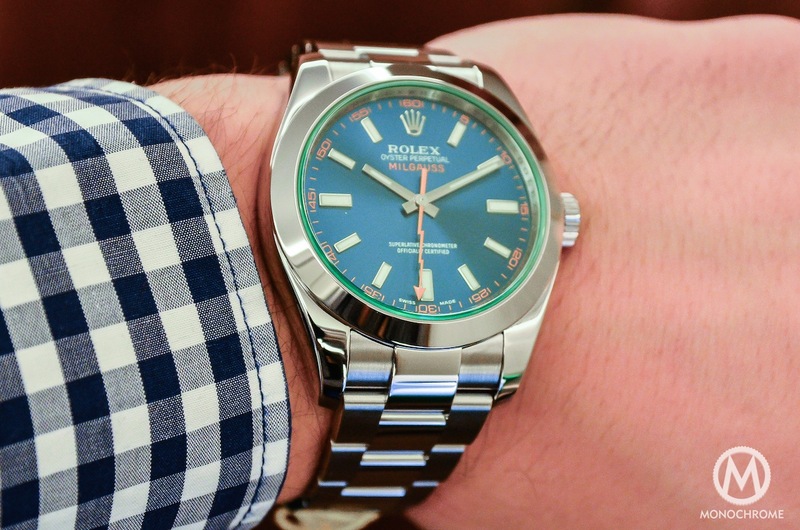 Let us introduce you to the Rolex Milgauss Blue Dial Ref. 116400GV. The Milgauss – meaning 1000 Gauss in French – was introduced in 1956 as THE antimagnetic watch for those who worked in power plants, medical facilities and research labs (such as the CERN close to Geneva) where intense electromagnetic fields can affect the timing of a watch. Some of the moving parts of a watch, such as the balance wheel and spiral, are sensitive to electromagnetic fields that can affect the amplitude of their run and so change the frequency of the movement. An issue that some of you have faced once with your own watches (due to computer or mobile phone magnetism for example). But when it comes to working in such conditions all day long, an antimagnetic watch is clearly a necessity. A simple solution is to house the movement in a faraday cage, a protective enclosure formed by a conducting material, usually soft iron. The very first version of the Milgauss introduced in 1956, as the Ref. 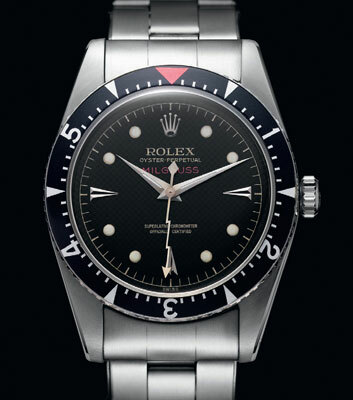 6451, was quite close in its design and specifications to a 1953 Rolex Submariner Ref. 6204. 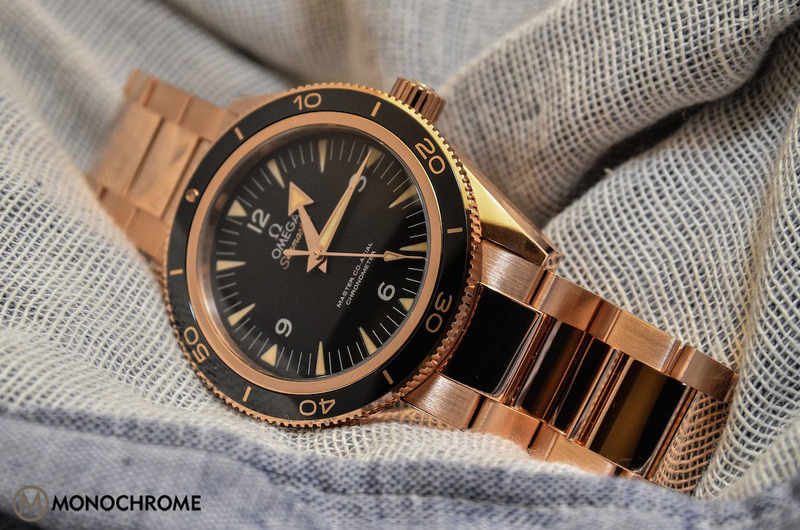 The oversized Oyster case, the black rotating bezel with a red triangle at 12, the riveted metallic bracelet and the non-protected Twin-Lock crown could be found on both the Milgauss and Sub. However, apart from the faraday cage and the antimagnetic capacity, the main differences were a honeycomb textured black dial, alpha hands (instead of the ‘Mercedes hands’), specific triangular indexes at 3-6-9 and a unique ‘lightning’ hand for the seconds, just to remind you of the purpose of the watch. The Ref. 6451 has a classical Rolex calibre, the 1080, as the antimagnetic properties come from the case and the dial (also in soft iron) and not from the movement. The main evolution was the introduction in 1960 of the Ref. 1019, showing a more classical design, with a case close to an Oyster Date. On the Ref. 1019 the black rotating bezel made way for a polished and fixed steel bezel, and the ‘lightning’ second hand for a classical straight one. The dial was available both in black or light grey, with applied baton markers and more straight hands. The watch was keeping its 1000 Gauss resistance, always with the help of a faraday cage. This model has been removed from the Rolex catalogue in 1988. 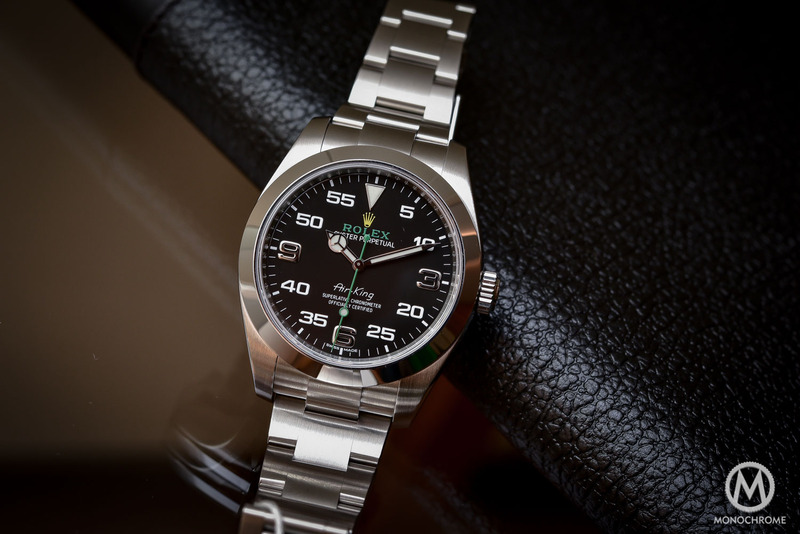 2007 saw the rebirth of the antimagnetic collection of Rolex with the Ref. 116400. Even though the Milgauss was not by far as popular as the Submariner or Daytona, the prices of old models used to be quite impressive in auctions and the watch remains highly attractive to collectors. Furthermore, in the present day, positions which require working working in magnetic conditions are increasingly common, especially in IT. 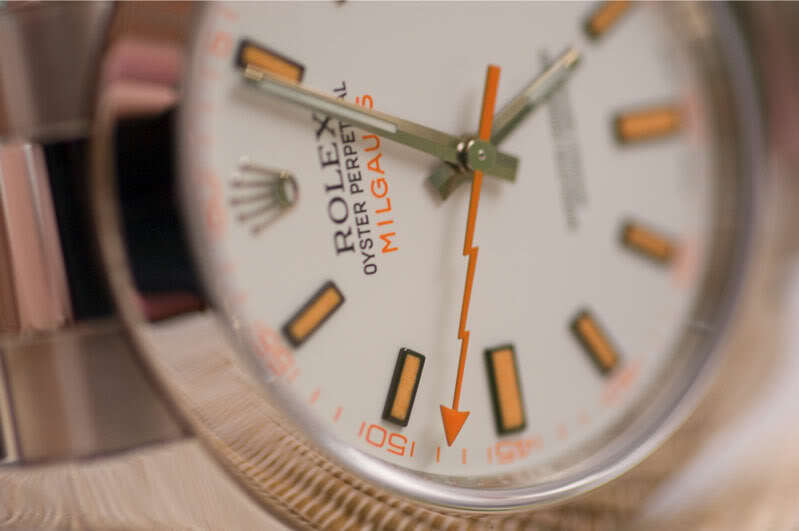 That may be the reason why Rolex reintroduced the Milgauss, with the specifications we now know: 40mm case, a black dial / green crystal version, a white dial version, the now iconic ‘lightning’ second hand and several orange tips on the indexes and hands. The main difference with the previous generations of Milgauss is the antimagnetic construction: if the old models were based on a soft iron enclosure to protect the movement, the new one opts for an antimagnetic hairspring (the blue Parachrom) enclosed in a magnetic shield composed of a magnetic permeability material. Not only is the watch is protected against electrostatic fields but also against magnetic fields. 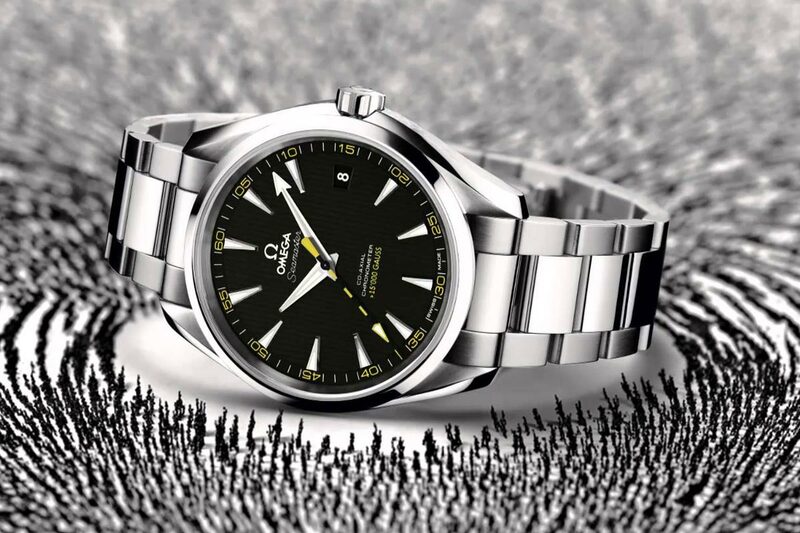 However, Omega is doing better since their 15.000 Gauss-proof watches are not based on a protective case, but on a completely new movement that is fully antimagnetic, that allows slimmer watches and even a see-trough caseback. You may ask yourself why the new Milgauss is (already) nicknamed ‘Z Blue’. The reason is that the electric blue dial is coated with Zirconium. The main novelty of this reference is that the blue tone is very bright and, as it presents a sunburst metallic finish, it goes from a deep blue to an aqua blue with green reflections, depending on the light conditions. When the watch was presented, we were dubious about all its different colors – blue dial, white indexes, orange second hand and markers, green tinted crystal. In the flesh, though, the combination works great, as the crystal and dial match with green reflections and the orange contrasts well with the rest of the watch, creating an original atmosphere – far from the monochromatic look of a Submariner. For the rest, the Ref. 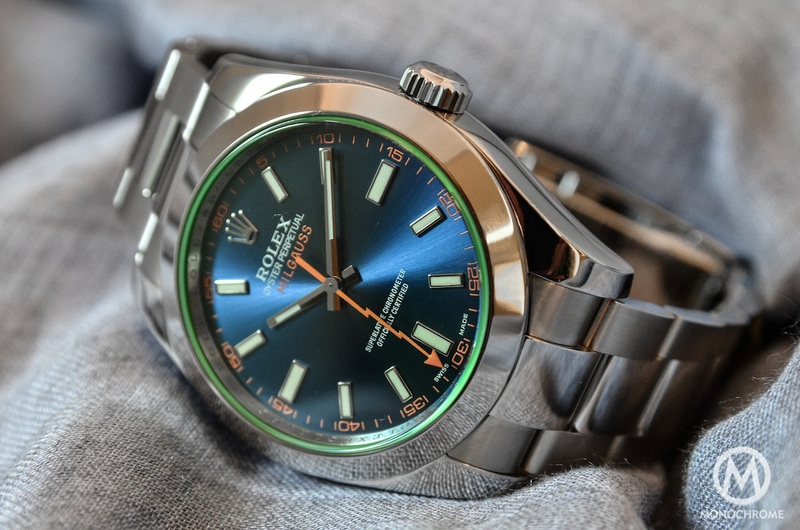 116400GV ‘Z Blue’ is a Milgauss, meaning a reasonable diameter of 40mm, a polished stainless steel case (water resistant up to 100m) and the very comfortable oyster bracelet with Easylink folder clasp (that allows very easy micro-adjustments). As do most of the Rolexes, it wears great, even with its 157 grams. The dial, aside from its blue color, features white gold markers and the hands are filled with white Chromalight; and there is the recognizable orange minute rim. The blue Milgaus is definitely set apart from the rest of the Rolex range, as all the Milgauss have always been. The blue dial offers some more eccentricity to a brand that some may call conservative but needs a buyer to whom that bright color combination appeals. The Ref. 116400GV is priced at CHF 7.800. 3. An interim phase of watch ownership possibly lasting years during which the case has too many scratches to appear new and too few to appear nicely-worn and patinated. But a Rolex with personality is a rarity these days, so it gets a thumbs-up from me.